The addition to Muhlenberg’s Life Sports Center was designed to visually and functionally link with the adjacent stadium and track. The curved-glass facade of the addition gracefully echoes the curve of the existing track and allows patrons to watch outdoor track and field activities as they use the indoor equipment. As part of its long-range campus plan, Muhlenberg College sought to enhance its student recreation facilities. The College selected Spillman Farmer Architects to assess and design options for renovating or adding space to the existing building, the Life Sports Center. Working in partnership with the College, our design team developed a renovation program and expansion plan that accommodates more and varied recreation and fitness activities. Among the improvements are a fitness room with cardio, free weight, and Pilates equipment, a health and counseling center, locker and training facilities for field sports (field hockey, softball, soccer, football), and new office space for the athletic department. Also included in the center is the Powerhouse Café, where students can grab a nutritious snack after a workout. The new addition, a glass, limestone, and brick structure, was designed to visually and functionally link with the adjacent stadium and track, which the College had recently upgraded. The curved-glass facade of the addition gracefully echoes the curve of the existing track and allows patrons to watch outdoor track and field activities as they use the indoor equipment. 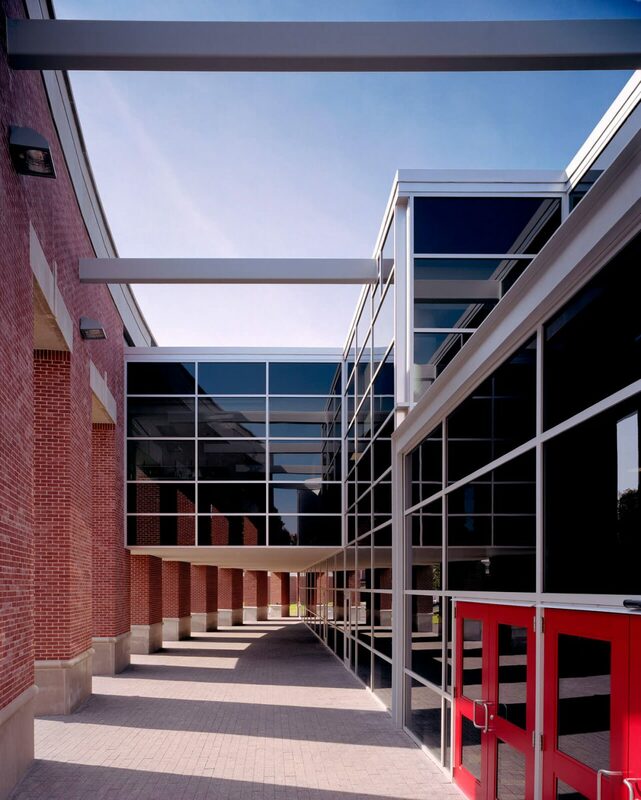 The addition was also designed to create a single, visually prominent entrance to the building. This single entry, located on the side of the building facing the campus proper, makes the Life Sports Center more inviting to students and also increases security and control for staff. The design outcome of the new complex has drawn stellar reviews from students, faculty, coaches, and trustees. Perhaps the architects’ greatest accomplishment was linking new space and existing space while providing maximum visual transparency throughout the adjoined structure and to our recently-completed stadium.